Depicted is a typical T-TRAK-N inside corner1 intended to work with the typical r282/315 curves in a layout. The measurements for this picture were obtained from a module obtained by a kit manufacturer. Inside corners can be hexagonal or pentagonal with dimensions adjusted to match the modeler's preferred module depth. The track radii for this corner, as depicted, consists of two pieces of r315-15o, two pieces of r282-15o, and two pieces of r315-15o for the outer curve. 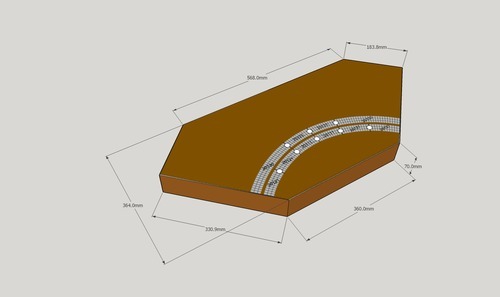 The inner curve consists of one piece of r348-30o, two pieces of r315-15o, and another piece of r348-30o.2 The traditional track arrangement for the inside corner consists of a 29 mm section between two r282-45o curves for the outer track and one between two r315-45o curves for the inner track.